Why Can’t We Get Greener When We Want To? Trevor Clements, Tetra Tech’s Mid Atlantic regional manager for Integrated Water Management, is co-leading efforts to support the City of Raleigh, North Carolina, vision for advancing low impact development and green stormwater infrastructure citywide and shares how removing barriers in city codes, policies, and operations is essential to moving forward. All opinions expressed in this post are the author's own. I mentioned in my last post that the average American is disconnected from the value of water and the role that it plays in their community. This disconnect often includes aspects of stormwater management and the benefits it has for water quality, public safety, and natural resource conservation. Now, more than ever, we are in the position to help communities make the connection between the value of water and stormwater management by demonstrating the benefits of capturing and reusing stormwater runoff in conjunction with land re-development and development. Take for example innovative builders, such as Serenbe, who have put in place low impact development (LID) techniques, including cluster housing combined with land set aside for conservation, to offset impacts to water quality caused by stormwater runoff from developed land. These efforts allow for better stormwater management that results in less pollution to our waterways and more green, sustainable stormwater infrastructure within the community. So how does it work? LID emphasizes site design that frequently incorporates stormwater management practices such as bioretention, bioswales, permeable pavement, and green roofs—called green stormwater infrastructure or GSI—that mimic natural landscapes to retain, infiltrate, or evaporate the stormwater onsite to pre-development levels. Select soils and vegetation within the GSI help to filter pollution before the water infiltrates, which protects downstream waterways by preventing direct runoff into streams or drainage systems that dump into streams. Using GSI is a significantly different approach than what has been done in the past to address stormwater management needs in land development. For decades, we have built our communities under the principle of moving stormwater off of a property as quickly as possible into storm drains to prevent flooding. In addition, local development ordinances often require use of stormwater management techniques and provisions that make including LID and GSI in land development challenging. Historically, adding greener practices to land development has resulted in additional time and cost to site development that may offset the direct benefits of using GSI practices. To help developers overcome some of these challenges, Tetra Tech has worked closely with the City of Raleigh to make including LID and GSI in public and private development projects easier. Over the past couple of years, Tetra Tech has helped the City of Raleigh remove potential barriers and advance the use of green techniques in land development by collecting input from stakeholder workgroups and developing recommended revisions to City codes, policies, and operational procedures. Tetra Tech also has created GSI and LID fact sheets to educate the development community about effective GSI practices and provided sample templates to the City and local developers that show how cost-effective GSI can be incorporated in the street right-of-way. This past September, the City Council unanimously endorsed more than 25 major revisions to its Unified Development Ordinance (UDO), laying an even stronger foundation for a greener city. Adjusting development requirements with the City is just one element of bringing green stormwater management practices to the forefront of land development. 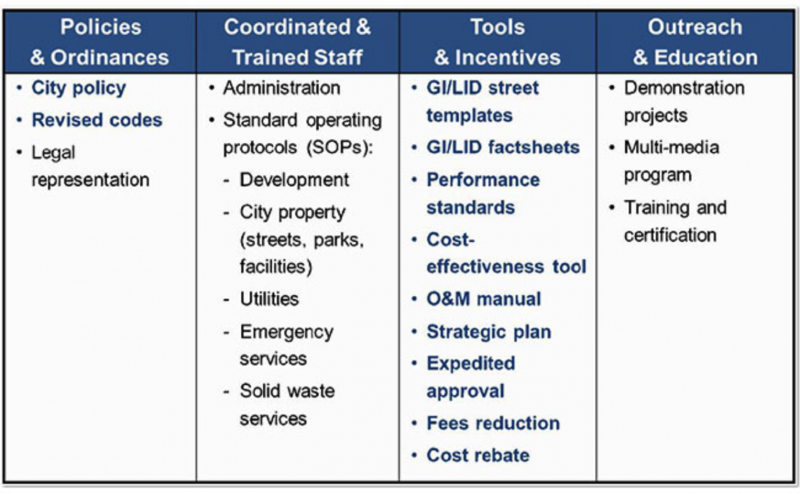 As Raleigh developers become familiar with the new code and policies, we encourage them to explore opportunities to adopt new business models that help make a seamless transition to applying LID and GIS in their designs. A business model that includes sustainable GSI practices can be good for the local economy, quality of life, and the environment. 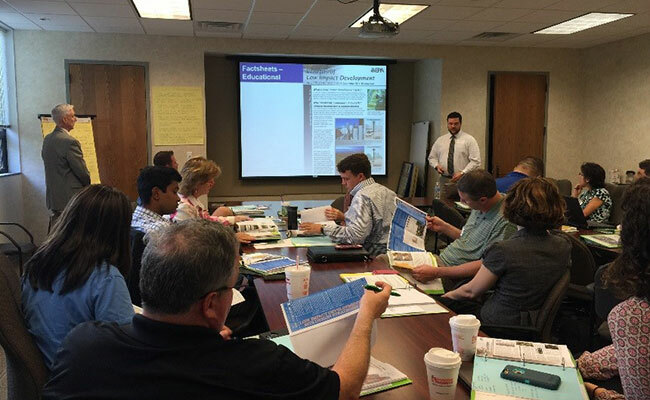 One step that Tetra Tech is now supporting involves helping the City implement a process aimed at expediting development and building permits for those whose designs meet LID and GSI objectives. Helping people to better understand the value of water, including stormwater, and making it easier for them to apply green techniques such as LID and GSI can help communities also see more “green” associated with economic prosperity and a higher quality of life. That is a water connection we would all like to see.